A Very interesting and powerful political thriller about the manipulation and back-stabbing involved in running a campaign. The Ides Of March is a fascinating movie about two different campaigns and the secrets and games that each one plays on the other. it mostly focusses on one campaign, which is that of mike morris, a sentator who is looking for the democratic nomination to run for president. the movie isn’t about the issues or about the election, as much as it is about the behind the scenes back-stabbing. when steven (gosling), goes to meet with the other side, all hell breaks loose. then, on top of that, a major secret comes out and steven has to figure out how he wants to handle it. this is a smart movie. the first half is all setup, and it works to get us ready for a second half packed with surprises and energy. The Ides of march is a movie about a young guy named steven, (Ryan gosling), who is working for the campaign of a man he thinks just might be the next president. that candidate is mike morris (george clooney), and he is currently in a competition for who will get the democratic nomination. it’s between him and a guy named pullman. the republicans want pullman to win because they think their guy can beat him in the future, whereas morris just might have the real stuff to become president. steven practices a speech in an empty auditorium when the movie begins. later on, we see morris deliver that exact same speech, only do it a little bit better. steven is not only a speech writer, but also an advisor. 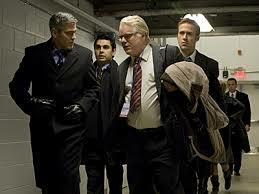 he is second only to morris’ chief advisor, paul, played by phillip seymour hoffman. and then there’s the competition. paul giamatti, playing tom duffy, the chief advisor and head of pullman’s campaign. the big issue at the start of the movie is how the senator, played by jeffrey wright, wants a promise that if he endorses one of these candidates in the election then that person will promise him a spot on the cabinet if he becomes the president. morris doesn’t want to make that deal. getting the senator’s nomination, is a big deal, and will pretty much guarantee the election, but morris feels like to make a deal like that, and bring someone on board who isn’t necessarily the best for the job, would be a mistake. that’s where he and steven differ. steven starts a relationship with an intern who is also working on the campaign named molly (evan rachel wood). they are both young (although she is apparently ten years younger than him), and they meet at each other’s hotels and have fun together. and one day, steven gets a call from tom duffy, requesting a meeting. steven is completely thrown off balance and doesn’t know what to do, but he ends up going to the meeting and sitting down with the enemy. duffy offers steven the chance to come work for him and pullman. he makes some convincing arguments, but in the end, steven walks away. and then he goes and tells paul. this is where the movie really starts to get good. so far, it’s been just okay. the characters and conversations have been interesting, but there’s been no pull. nothing to keep us in our seats and to make us care about this election, or really any of these characters. that’s all about to change. two big plot twists are now revealed, one after the other. the first one involves a secret of mike morris’ that steven finds out. the second is that the new york times reporter ida (marissa tomei) who seems to have the scoop on everything, now has one on steven. she’s heard that he has been talking to duffy and she’s going to put out a story about it and about how morris’s chief advisor is thinking about jumping ship. and now steven is racking his brain trying to figure out who leaked the story to ida. things get even more intense once paul and steven find their relationship deteriorating and that they are both out to get each other. each of them walks the line of potentially being fired from the morris campaign and each of them ends up coming pretty close to switching sides. the two of them both try to influence morris and people do end up getting fired. on top of that, there’s also some death. a major character in the movie is found dead and the ramifications for all of it end up being so big that they just might destroy morris’ campaign. the story really gets intense as it goes on. and it comes to a point where steven and morris have their own showdown scene where they are both calling each other’s bluff. 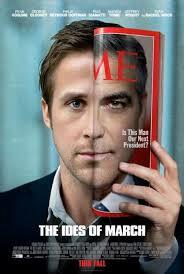 Ides of march is a great, well-written movie. it is also extremely well acted by a very talented cast. phillip seymour hoffman and paul giamatti are probably the two greatest supporting actors working today. these are the guys who almost everything they touch turns to gold, and it’s usually in large part because of them. just think of hoffman in doubt or before the devil knows you’re dead a few years ago, or paul giamatti in just about anything he’s touched recently (barney’s version, win win). and they are just the supporting players. clooney and gosling are the movie’s stars, and those two actors are definitley on top of their game here. gosling, in particular, really delivers by exuding both confidence and uncertainty at the same time. the movie works because it is well-written and smart. there are surprises packed in that we never see coming, and the actors handle every new twist and turn as if they were made to play these parts. before the twists and secrets started coming out, the movie was interesting and artistic. but the artistic goes away once the story really starts to get going, and that’s a good thing. the last thing we want is to be is distracted by the singer who is performing on stage when a heated conversation is taking place at the table on the other side of the room. clooney not only stars in this movie, but he wrote and produced and directed it too. it’s the best movie he’s directed so far. way better than confessions of a dangerous mind, leatherheads, or good night and good luck. like that last movie, this one is also about the political landscape, only it tries less to be artistic and more to be gripping. it certainly accomplishes it’s goal.